Brighten up your home this autumn season with a new landscape installation. Don’t let the lack of sunlight and colder temperatures keep you from enjoying yourself in your backyard. Fall outdoor living projects are easier to schedule in Northern Virginia since most people hire contractors to install landscaping projects in the spring and summer. Not to mention how accessible contractors are in the fall because families are busy with back-to-school-routines. With an experienced landscape design company, you will be able to obtain the perfect fall landscape design you have always wanted. Groff Landscape Design is a landscape design and installation company in Arlington, Virginia that serves cities throughout the Northern Virginia area. Our team of dedicated contractors ensures a low-stress landscape installation experience personalized to your home design preferences this season. From patio and firepit installations to deck constructions and more, our landscape professionals will help you decide the best landscape design for your home. Below are a few of our top four landscape design projects to consider this fall season. Take advantage of the fall weather and cooler temperatures and plant new trees and shrubs. Giving your landscape more texture with various plants will make your home landscape design pop! The fall temperatures will also be easier on your plants because the soil retains more moisture, which promotes strong root growth. Your plants will receive proper nourishment that reaches the root system and allows them to build up enough energy to last longer. Be sure to routinely clean up your yard by removing excess fall leaves and debris to keep your plants thriving all season. While patios are very versatile landscape construction projects, building a patio will provide many benefits for you such as enhancing your home’s beauty, increasing the property value, and having an outdoor living space to commune with your family and guests. In the fall season, most of your vegetation is also dormant so it’s less likely you will harm your plants during the installation process. 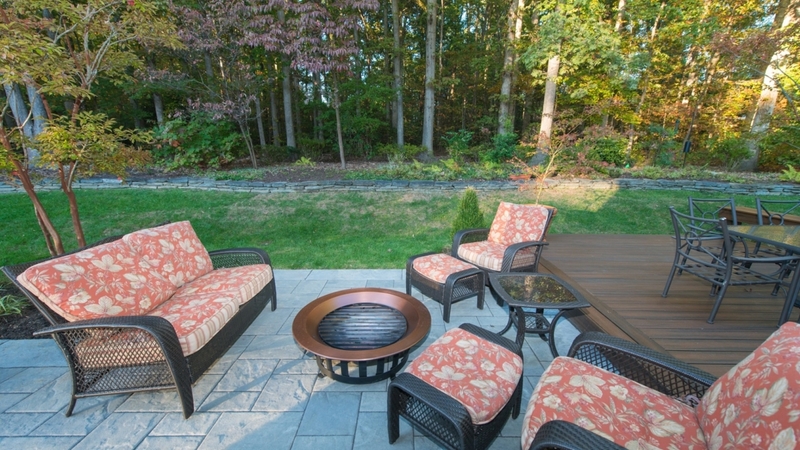 Having a patio installed this fall will mean it will be ready for the warmer seasons too. With a patio, you will even reduce your yard maintenance duties and money spent on lawn upkeep. Gathering around a firepit with the crisp and cool weather is a relaxing evening affair you don’t want to miss out on. A firepit will provide a comforting warmth and soft glow during the colder autumn nights. It also becomes a communal centerpiece to your yard and doubles as an outdoor cooking surface. Just think about all the marshmallows you can toast over the fire pit flame for an evening of s’mores! There are many benefits to constructing an outdoor kitchen, and one of the best benefits is that you will feel more inclined to grill your food outside! This means you will save money on eating out, be healthier, and keep a variety of smells from spreading inside your home. Cooking outside also keeps your utility bills low since there isn’t a need for your air conditioner to keep your home cool and comfortable. Looking for a quality landscape design company in Northern Virginia that doesn’t break the bank? Groff Landscape design professionals pride ourselves on providing the best landscape design and build installation services possible with no hidden fees. Our team is passionate about surpassing our clients expectations and helping them achieve their fall landscape design goals. Groff Landscape Design contractors will provide a variety of landscape installation services tailored your needs including plantings, deck construction, patio installations, and more. Make your outdoor living space the place to be this fall and give your home the enhancement it deserves! Get started today and schedule a consultation with a Groff Landscape Design contractor. Contact us at (703) 999-8225 to speak with a landscape design expert!